From the ridiculous (at times) to the sublime. And I know that many people think Leonard is depressing, but I have found him to be understanding, serious at times, funny at others and ultimately uplifting. To even attempt to understand matters of the heart is incredibly difficult, I know this as a writer myself; but to write unbelievable poetry – and put it to unique and warm melodies is simply incredible. Only Dylan and Joni have really come anywhere close to Leonard in the modern era. Now, a bit of History. I first heard Leonard in 1969. His first album had crept out, practically unnoticed two years earlier. Carol and I were temporarily staying with three Canadians I was working with. We had been thrown out again by her parents. We slept on the sofa in a basement flat, sharing with not only the Canadians but an ever-changing mix of young women and men. It seemed one long constant party; lots of drinking, smoking and loud music. 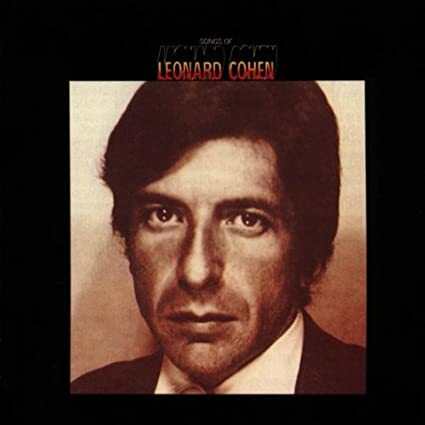 But as the nights wore on Leonard’s first album was put on the turntable and I fell in love with it. Each song is basically just guitar (and he is a very good player too) and voice. His producer paid Leonard the compliment of reading a book during the recording and interfering not at all. When I got my first record player this was the first record I bought. I must have played it thousands of times – and I never tire of it. Every song is brilliant from ‘Suzanne’, through ‘The Sisters Of Mercy’ and ‘So Long Marianne’ right through to ‘One Of Us Cannot Be Wrong’. 1969 saw his second album Songs From A Room. It is of course excellent, though I have always relegated it to the second tier – despite three great songs ‘Bird On The Wire’, ‘Nancy’ and Lady Midnight’. Maybe it is the production with the Electric Guitar and Orchestra seemimg to impinge on his vocals, maybe it is the bleak few songs about fathers and sons, maybe it is just me – because on re=listening it is of course great. Just maybe not as great as his debut. Best line – ‘Nancy was alone, a 45 beside her head, an open telephone’. That simple item – an open telephone – is the moment of genius in the song. Third album came a year later – and this is simply one of the very best – ‘Songs Of Love and Hate’. What a great title – and the cover photo of an almost drunk Leonard sets the scene for some really emotional songs. And from the opener ‘Avalanche’ the scene is set; some self-loathing, some worship, a lot of confusion – and miles of poetic intensity. Musically it is a step forward too, the almost jolly ‘Diamonds in the Mine’ and the almost spoken ‘Last Year’s Man’. But though all the songs are excellent the best are the two which were still in his live shows right to the end – ‘Famous Blue Raincoat’ with it’s confusing trio (or is it a quartet) of characters – and ‘Joan of Arc’ a wonderful evocation of emotion and sacrifice, an epic poem indeed. But the best line is ‘The skylight is like skin for a drum I’ll never mend.’ I am never sure what this really means but like all great poetry it simply works.